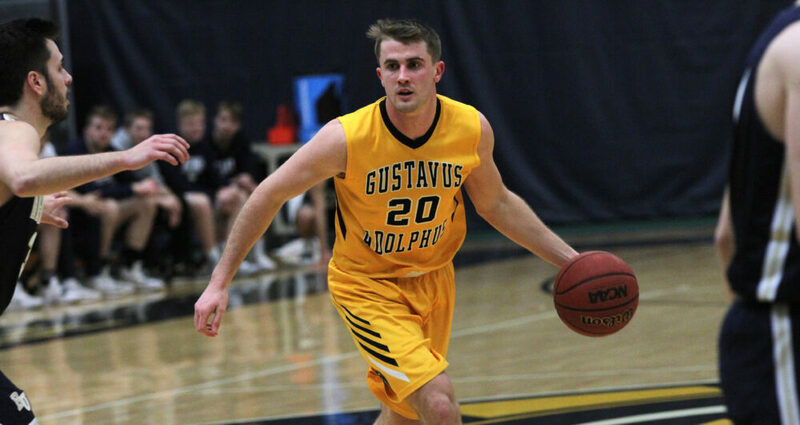 SAINT PETER, Minn. – The Gustavus men’s basketball team suffered a MIAC quarterfinal loss to Bethel Tuesday night 93-67. The loss will conclude the season for the Gusties who posted an 11-15 overall record. After the Royals jumped out to an 11-6 lead to start the game, a pair of Vannis Smith (Jr., Crystal Lake, Ill.) layups on back-to-back possessions pulled the Gusties within one. Bethel quickly responded though, knocking down three pointers on three of their next four possessions matched by just one Gustavus basket to take a 20-12 lead. The Black and Gold responded to the run with a 9-2 run of their own capped off by a Riley Sharbono (Sr., Marshall, Minn.) jumper. Bethel though, started to hit its stride, as in the last 7:02, the Royals outscored Gustavus 23-9 to take a 15 point advantage going into halftime. In the first 20 minutes the Royals shot 58.1 percent (18-31) while the Gusties were 48.3 percent (14-29). Bethel did a lot of their damage behind the arc, going 9-for-19 (47.4 percent) compared to Gustavus’ 1-of-9 (11.1 percent). A pair of Spencer Tollefson (Sr., New Richland, Minn.) free throws and a Nolan Malo (Fy., Owatonna, Minn.) layup matched by one Royal basket to start the half cut the lead to 13, but Bethel would slowly start building their lead. With 15:10 to play the Royals hit a three to extend their lead to 59-39 and less than five minutes later Bethel commanded a 73-47 lead. The Gusties were able to keep pace with the Royals the last 10 minutes with both the Gustavus and the Royals scoring 20 points. The Black and Gold shot well down the stretch getting a pair of three-pointers from both Isaac Douglas (So,. Montevideo, Minn.) and Charlie Krambeer (Sr. Rushford, Minn.). In the contest, Malo led all Gusties with 12 points on 5-9 shooting to go along with a team-high seven rebounds. Douglas was the other Gustie in double figures with 10.